Ashley McKenna is a blunt instrument. Find someone, scare someone, carry something; point him at the job, he gets it done. He generally accepts money upon completion, though a bottle of whiskey works, too --- he's comfortable working on a barter system. It's not the career he dreamed about (archeologist) but it keeps him comfortable in his ever-changing East Village neighborhood. That's until Chell, the woman he loves, leaves him a voicemail looking for help --- a voicemail he gets two hours after her body is found. Ash hunts for her killer with the grace of a wrecking ball, running afoul of a drag queen crime lord and stumbling into a hard-boiled role playing game that might be connected to a hipster turf war. Along the way, he's forced to face the memories of his tumultuous relationship with Chell, his unresolved anger over his father's death…and the consequences of his own violent tendencies. 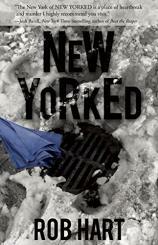 NEW YORKED takes you deep into the seedy underbelly of New York with a strong noir voice in the tradition of Lawrence Block's iconic character Matthew Scudder --- an unforgettable debut crime novel from an exciting new voice you'll be hearing much more from.